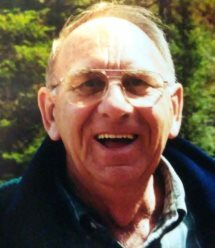 Wayne A. Smith, 83, of North Berwick passed away peacefully January 29, 2019 in the Varney Crossing Nursing Home in North Berwick, ME. He was born June 26, 1935 in Milo, ME, the youngest of seven children born to Lavern C. and Florence D. (Fletcher) Smith and attended Derby and Milo Schools. He spoke often and fondly of the many summers his very large family spent enjoying their camp on Little Boyd Lake. A graduate of Milo High School, Wayne (“Lanky” to his friends) was a star basketball player, leading his team to the New England championship his senior year. He enlisted in the United States Air Force in 1954 and served in Germany during the Korean Conflict. He was very proud of working overtime cleaning the base movie theatre which allowed him to save enough money to purchase a brand-new Volkswagen Beetle which he shipped home and drove for many years. After his military service, Wayne graduated with his bachelor’s degree in Business Education from Husson College, where he also played basketball. There, he met and married Loretta Dion in 1961. They were married for 15 years before her passing in 1976. He was pre-deceased by his parents as well as his brothers, Harry Smith, Gerald Smith, and Beverly Smith; sisters Pauline Albee, Shirley Clukey, and Annabelle Titcomb. Surviving are his wife, Janet Smith; his son, Steven Smith and wife Kathleen of Troy, ME; two daughters, Kelly Michaud and husband Edward of Wells, ME, and Susan Smith of N. Berwick, ME; stepson Michael Griffin and wife Valerie of Rochester, NH, two stepdaughters, Ruth Griffin and her husband Michael Coleman of Rockport, ME, and Mary Bouchard and her husband Tom of Wells, ME; many grandchildren, and great grandchildren, as well as numerous nieces and nephews.